Heriberto “Tito” Gonzales and his talented band return to the Freight to play rumba, guaracha, and son—traditional, high-energy Cuban dance music pioneered by greats like Arsenio Rodriguez and later revived by the film The Buena Vista Social Club. 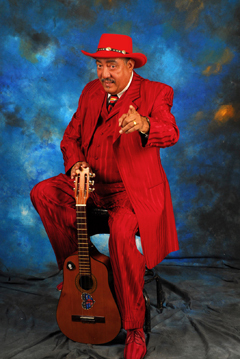 A celebrated musician and charismatic showman, Tito sings and plays the small Cuban guitar with three sets of doubled strings known as the tres, driving the music and the complex rhythms with delicacy and swagger. His current band includes Miguel Martinez on flute, Julio de la Cruz on piano, David Frazier on congas, Colin Douglas on timbal, Sandy Poindexter on violin and claves, and Abo Gumroyan on bass. Tito first learned the tres from his father in Havana, but worked for years as a fisherman, an auto mechanic, and a cab driver before forming a band with his fellow cabbies and becoming an overnight Cuban sensation at the age of forty. He arrived in the Bay Area a dozen years ago, and when he’s not playing onstage in his trademark fedora, he’s passing along his skills to young musicians in venues like Berkeley’s Jazzschool. Come out and enjoy Tito and his expert band playing songs of heartache and love and tobacco and rum with a seductive Cuban beat.